Our sports parties provide every child's party with an unrivalled sense of camaradarie and fun on their special day. Our Tennis birthday parties are no exception as we provide fun and interactive games for toddlers and children from 18 months through to 13 years. We encourage our birthday children to go all out and encourage guests to dress in their best Tennis kit. Digital invitations (can be printed at home) with a Tennis theme and your child's photograph. What Happens at a Tennis Party? Tennis parties are great for children of all ages. We have more intense games for the pro's to get them moving and thinking or varied games in which each child has their own ball and racket to perfect their skills! The games we play are friendly, challenging and really get the mind and body working. We learn the basics for the less experienced children and adapt all the games accordingly, as always, we finish with friendly, but competitive game of crazy tennis. 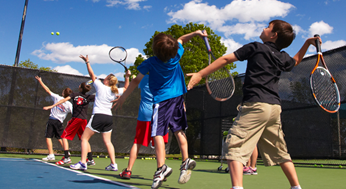 Tennis parties can be a single event party or used in a mixed sports party. Tennis parties can be indoors in a hall or outdoors on hard court, it is not recommended on grass turf but is still possible. We will provide the net.